The Hoppe name has represented quality, reliability and innovation in sharpening and knife manufacturing industries for more than 125 years. Our outstanding reputation means that our customers are prestigious companies in Germany and abroad. 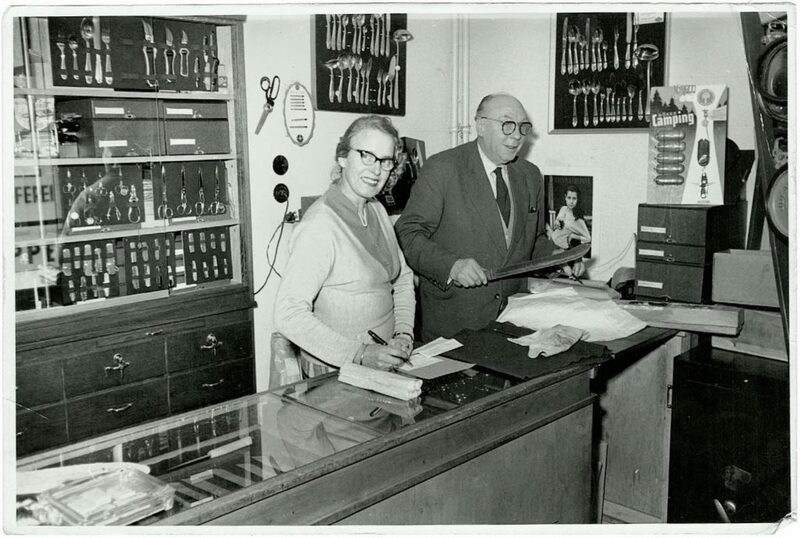 A lot has changed since Hugo Hoppe I started the family business in Hanover in 1891. In the early years, the company moved to different premises within the city several times. After the complete destruction of the company at the end of World War II came reconstruction and the years of economic miracle; the company expanded from a cutler and grinder to become a traditional tool grinding shop. It then developed to produce its own machine knives in-house. The machine pool grew in line with the factory space; patents and registered trademarks added to the value of the company – a testament to its continuous innovative creativity. Yet despite all these changes, one thing has always remained the same: HOPPESCHLIFF regards its customers as partners. We adopt a hands-on approach to meeting your needs flexibly, quickly and personally. We combine traditional craftsmanship with state-of-the-art technology. Born in Solingen, cutler Hugo Hoppe starts the first Hanover grinding shop in his own name in the city's Vahrenwalder Strasse – Hugo Hoppe Hannover (HHH). Hoppe moves the business to the Gilde Bräu building at Weidendamm 11. He opens a retail shop for Solingen knives at the same time. The son of the company founder, Hugo Hoppe II, takes over the company and drives the business forward with a highly innovative approach. The business, including the workshop and retail shop, moves to Herschelstrasse 17. Hugo Hoppe II starts a new business on the site of the Hanover slaughter house. As the following entry shows, this move shows considerable foresight. At the end of March, just a month prior to the end of World War II, the business premises and home of Hugo Hoppe II were completely destroyed in the final bomb attack on Hanover by British and US air forces. From August, the company starts operating at the slaughter house site again. The company HUGO HOPPE HANNOVER GmbH is founded, based at Am Bokemahle 15. Here the company experiences the start of the post-war economic boom known as the “economic miracle”. Horst Hugo Hoppe – Hugo III. – passes the master craftsman's examination to become a cutler. After a further change of headquarters – Am Marstall 13 – and an outsourcing of technical operations, the company premises are rebuilt in the Hainholz commercial district at Mogelkenstrasse 26. This remains the HOPPESCHLIFF headquarters today. Horst Hugo Hoppe takes over the company and renames it HOPPESCHLIFF – with resounding marketing impact. Hugo Herbert Mark Hoppe – Hugo IV. – wins the prize for best cutler craftsman in the 'Young Craftsmen Competition' organised by the German Confederation of Skilled Crafts (Leistungswettbewerb der Deutschen Handwerksjugend) with his journeyman’s piece. The company becomes a member of the Trade Association of German Precision Tool Grinders (FDPW). Master cutting tool mechanic Mark Hoppe – Hugo IV. – takes over as managing director of the company. Hugo IV. gains his career certificate in business, management and administration (Betriebswirt des Handwerks). As one of his first official acts, he extends the production area of the company to a total of 800 sqm by building a new hall. HOPPESCHLIFF implements a quality management system (QMS). The company celebrates its 125-year anniversary by redesigning its logo.